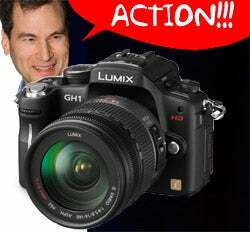 Hopefully things are cloudiest before they clear up: Nobody buys real camcorders anymore, entry-level DSLRs are all about HD video, and NYT's David Pogue picks Panasonic's Lumix GH1 as the current 1080p shooting champ. He's probably right. The two cameras I am evaluating at this very moment—Canon's $900 Rebel T1i and Nikon's $850 D5000—are damn fine still cameras with particularly attractive prices, that draw from the competitive legacy of their two makers, and are compatible with hundreds of lenses in each company's respective armory. But for shooting video, they're not exactly easy. Or even good. But where does this leave camera shoppers? The problem I have with Pogue's piece is that I still don't know what to buy. And it makes me even more concerned for my own recommendation on the Nikon and Canon. I've placed a lot of weight on that video capability, as a reason to upgrade, but in light of the potential video quality demonstrated by the GH1, wouldn't it be worth buying a clearance DSLR and a frill-free Flip camcorder and wait until this while mess gets sorted out, and video quality the likes of which Pogue rhapsodizes is available in SLR cameras we actually want to own?